Can you believe it? Gay marriage is legal in all 50 states! Time to show your pride. Whether you’re a supporter of equality or a proud member of the LGBT community, you can show your support in a fashionable way. 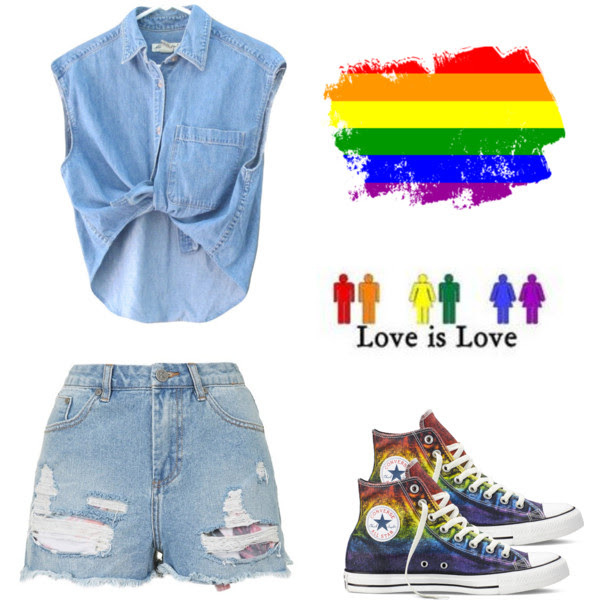 Check out 3 prideful ways to rock your rainbow in style. The Sporty Look- Some women live in their chucks. What better way to show your pride than with rainbow colored Converse? A simple denim on denim look will keep the focus on your colorful feet. The Casual Look- Heading to brunch? Hanging with friends? Rock a cool, casual look by pairing skinny jeans with a New York Pride tee-shirt. The Statue of Liberty and rainbow fused muscle tee shows pride on another level. Stand tall like lady liberty in a pair of mint green sandals from Steve Madden. The Dressy Look- A celebration in color is the best kind of celebration! For a night out on the town, a bold color like the orange dress pictured below from River Island go perfectly with subtle rainbow colored sandals. If orange isn’t your favorite hue, the shoes allow you other color options. How do you show your pride through fashion?